King of Shaves Shave Oil SuperCooling with refreshing Menthol is formulated to give a superbly close and comfortable shave delivering enhanced blade lubrication with no irritation or rashes. It can also be used as an effective Beard Oil. Leaves skin smooth, supple and moisturised – not dry and tight. Ideal for sensitive skin. A better oil for a better shave! King of Shaves grapeseed based Shave Oil SuperCooling with a burst of refreshing Menthol is formulated to give you a superbly close and comfortable shave. It delivers enhanced razor glide and excellent blade performance leaving your skin incredibly smooth, supple and moisturised, not dry and tight. It makes a great Beard Oil too! Up to 75+ shaves from one bottle. 15ml. PP Cap. PE Plug. PETG Bottle. APET Pack. Card Inner. Made in the United Kingdom. Color and design of actual packaging may vary slightly from those shown. PREPARE: Give your stubble a good wash and soak. Wet stubble is so much easier to cut, which means less tug and pull, less irritation and more comfort so shave during (or straight after) a warm bath or shower. Cleanse face first with quality face wash or gentle exfoliating scrub. Work 2–3 drops of Shave Oil thoroughly into your beard, to ensure even coverage and to lift the stubble away from the skin. Pay particular attention to anywhere you get any shaving rash, remembering the bit of the shave prep that does all the work during your shave is the thin film-like barrier between your skin and the blade. SHAVE: Using a clean sharp blade, shave carefully in the direction of hair growth taking care around the sensitive neck area. Take it slow and steady, rinsing the razor frequently to prevent clogging and to ensure you get the most bristles in a single pass. For heavy stubble or several days’ growth focus on short strokes and thorough rinsing. Shaving with the grain, in the direction hair grows, will reduce the tug and pull and lessen the chance of irritation. If closeness is a problem, re-apply Oil and then shave across the grain (XTG) in a second pass. Tip: Only a few missed bristles separate a good shave from a great shave. Use your finger tips to feel for any missed bristles before you finish and rinse. PROTECT: After shaving, thoroughly rinse off with cool clean water as this helps close up the skin’s pores. Pat dry and protect skin immediately with a moisturiser or balm. Wet Electric: After cleansing, massage in 1–2 drops of Shave Oil and shave as normal. Dry Electric: Massage 1–2 drops of Oil onto clean dry skin. Wait 30 seconds, then shave as normal. 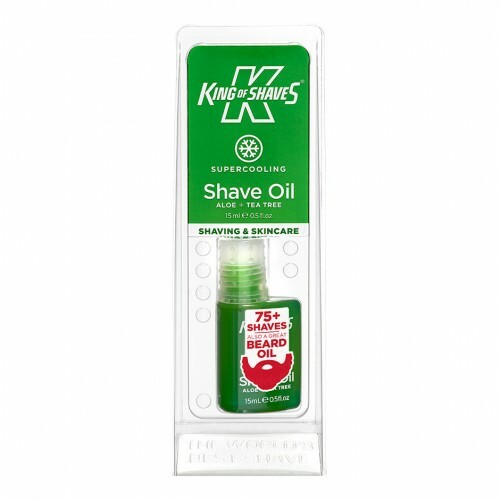 King of Shaves Shave Gel SuperCooling with refreshing Menthol is formulated to give you a superbly c..
Amazing razor glide and shaving performance from this concentrated Shave Serum that gives up to 60 s..